There are many misguided beliefs on how to control silica. 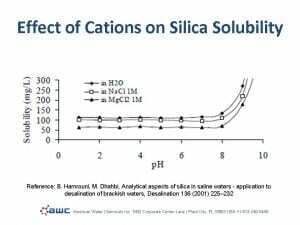 Some people recommend operating at a pH of 8, (the point of lowest solubility for amorphous silica) because they’ve heard that silica is more soluble at higher pH. Many others have stories about how they operated successfully with water that had 300 ppm silica by using one silica antiscalant or another. But few realize that silica scaling is dependent on many factors that include pH, temperature, divalent cation content (Ca, Mg, Fe) and divalent anion content (CO3,SO4). So just because an antiscalant was successful at one location that had 300 ppm silica does not mean that it will be successful at other locations, unless they have similar overall water chemistry. Silica fouls reverse osmosis membranes by polymerizing into longer chains that form an amorphous gel-like substance. The constituents in the water will actually determine whether those silica polymers remain in suspension and exit in the concentrate stream, or grow into large networks that deposit on the membrane. Polyvalent cations (multiple positive charges) like calcium or magnesium can increase the rate and extent of silica polymerization. Even monovalent cations (single positive charge) like sodium, when present in high concentrations, will increase silica polymerization. Sulfates on the other hand, appear to make silica more soluble – possibly because they are anionic (negative charge) and they complex (tie up) the cations that act as catalysts. Another theory is that sulfates interact with silicic acid to make a sulfate-silica complex that is more soluble. Soluble silica exists as a weak acid, so the higher the pH, the more silica will exist as anionic ions. In deionized water, this makes silica more soluble with increasing pH, as the silica ions repel each other and can no longer polymerize. 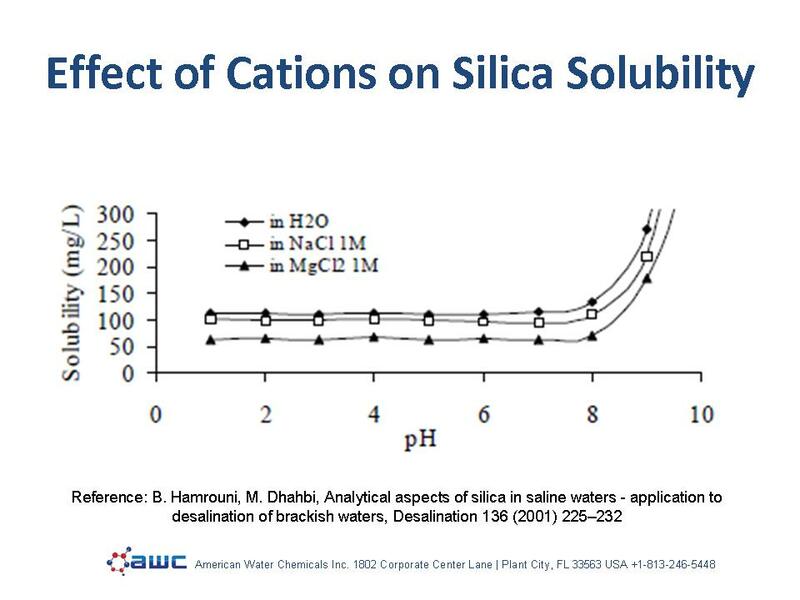 When there are positively charged ions in the water, like sodium or calcium, the repulsion between the silica molecules are reduced so they can polymerize significantly even at high pH (see graph). The constituents that have the biggest impact on silica fouling of RO membranes are those that form hydroxide salts. These include ferric hydroxide, aluminum hydroxide, and most phosphate salts (calcium phosphate, ferric hydroxyphosphate, aluminum hydroxyphosphate, etc.) 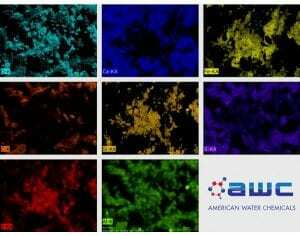 – (refer to paper “A Relationship Between Calcium Phosphate and Silica Fouling in Wastewater and RO Systems.”). Silica is highly attracted to hydroxides, so when hydroxide salts precipitate on the membrane, they act like anchors for the silica polymers that may have otherwise exited the membrane in the concentrate stream. Silica interacts differently with aluminum in that it can interact with the soluble tetrahedral aluminum that is soluble at high pH, to form aluminum silicate salts such as calcium aluminum silicate and sodium aluminum silicate. Silica therefore becomes extremely insoluble in the presence of aluminum – aluminum silicates salts from a substrate for silica scaling. So in answer to the question, “What antiscalant do we need to prevent silica scale in RO systems with high silica?”, AWC studies have shown that no single antiscalant will be effective in all situations. The antiscalant must be selected based on an entire water analysis; pH, temperature, TDS, cation species, and anion species must all be considered. A silica antiscalant that cannot inhibit iron hydroxide will not be effective at inhibiting silica scale in the presence of ferric ions. Likewise, a silica antiscalant used in water with a high phosphate scaling potential will not perform if it is incapable of inhibiting calcium phosphate. 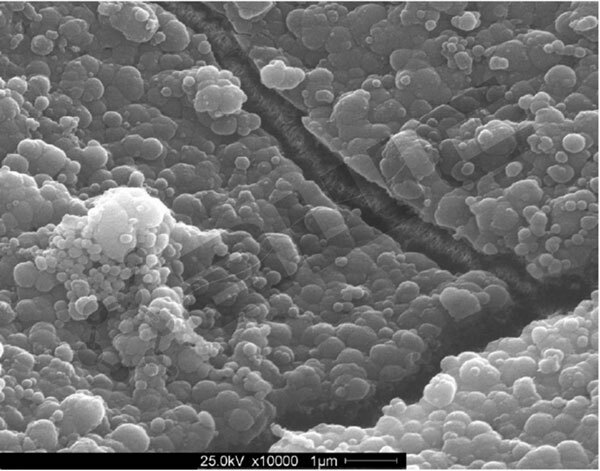 An antiscalant that is effective for control of aluminum silicate may not necessarily be effective at inhibiting silica scaling induced by ferric hydroxide or ferric hydroxyphosphate. Every situation requires its own customized solution to be designed by a water chemistry expert that is tailored to fit your individual need. For a customized scale prevention solution, contact American Water Chemicals, Inc.
©Copyright 2013 American Water Chemicals, Inc.